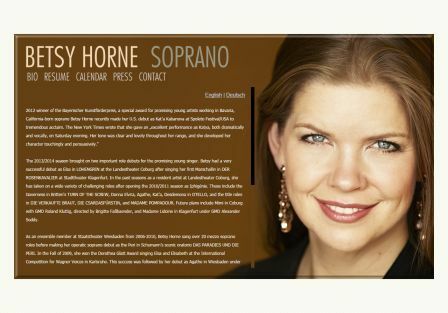 Betsy Horne earned vocal degrees with distinction at Cottey College and at the University of Kansas before being awarded a grant to study at the Hochschule für Musik Mainz with tenor Andreas Karasiak. Parallel to her studies, she appeared at the Oper Köln, Staatstheater Mainz, Maifestspiele Wiesbaden, and in leading roles at the Schwetzinger Festspiele and the Potsdamer Festspiele Sanssouci. From 2006 to 2010 she was an ensemble member at Staatstheater Wiesbaden, where she sang over 20 mezzo soprano roles before making her operatic soprano début as the Peri in Schumann’s scenic oratorio Das Paradies und Die Peri. In the Fall of 2009, she won the Dorothea Glatt Award singing Elsa and Elisabeth at the International Competition for Wagner Voices in Karlsruhe. This success was followed by her début as Agathe in Wiesbaden under GMD Marc Piollet, as well as invitations to sing at Wagner gala concerts in the NDR Funkhaus Hannover and at the 2010 International Wagner Convention in Stralsund. She was also engaged as a featured soloist at a gala concert celebrating the 100th anniversary of the Wagner Society of Bayreuth. Recent concert work has included the Vier Letzte Lieder, Brahms’ Requiem, Mendelssohn’s Elias, Barber’s Knoxville Summer of 1915, Wagner’s Wesendonck-Lieder, as well as Hindemith’s Hin und Zurück with Gabriel Feltz and the Stuttgarter Philharmonie and Kálmán’s Gräfin Mariza with the Rundfunkorchester München. The 2013/14 season brought two important role débuts for the promising young singer. She had a very successful début as Elsa in Lohengrin at the Landestheater Coburg after singing her first Marschallin in Der Rosenkavalier at the Stadttheater Klagenfurt. In past seasons as a resident artist at the Landestheater Coburg, she has taken on a wide variety of challenging roles after opening the 2010/11 season as Iphigénie. These include the Governess in Britten’s Turn of the Screw, Desdemona in Otello, the title roles in Die verkaufte Braut, Die Csardafürstin, Madame Pompadour, as well as Donna Elvira, Agathe, and Káťa. She sang Mimi in Coburg with GMD Roland Kluttig, directed by Brigitte Faßbaender, and in Klagenfurt under GMD Alexander Soddy, directed by Madame Lidoine. More recent engagements include: Sadko at the Opera Vlaanderen in Ghent and Antwerp; Arabella at the Leipzig Opera; Das Rheingold and Götterdämmerung in Wiesbaden and Otello in Klagenfurt. In the coming season she will sing Die Meistersinger von Nürnberg (Eva) and Tannhäuser (Elisabeth) in Wiesbaden, as well as Cardillac (Die Tochter) at the Opera Vlaanderen. 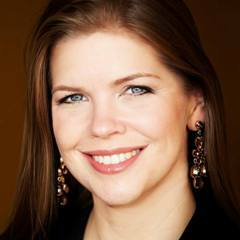 Betsy Horne has been awarded several prestigious prizes including first place at the Neustädter Meistersinger Voice Competition and the Vera and Volker Doppelfeld Foundation Prize at the International Chamber Opera Schloss Rheinsberg. In the Fall of 2007, a jury including Christa Ludwig, Brigitte Fassbaender and Charles Spencer awarded Betsy Horne the second prize at the 5th annual Hilde Zadek International Voice Competition at the Musikverein in Vienna, Austria. Betsy Horne studies with Brazilian soprano Neumar DeKanel-Starling.